Hi friends and Happy Friday! I’m so looking forward to today and the weekend! James gets to do the first reading at Mass today and I love that! He’s been rehearsing and it’s so special to hear him recite verses from the Bible. He actually inspires me to go deeper in my own faith. Fridays are “off” days for me when there’s no one at home besides me and Jordan and I cherish that time with her. As a mom, it’s so true that the days are long, but the years are short. I know Fall will be here before we know it and she’ll be in PreK3 so I try to soak in as much quality time with her as I can. Our Spring Break is always super early and so we’re already gone and back and I couldn’t wait to share our trip with you! I could have easily split this post into three, but I wanted to have all of the information in one place for you! So, this mama jama blog post recaps our trip, provides tips on traveling with a toddler, tips for taking a toddler skiing, and what to pack for a family ski vacation! First up, let’s talk Halloween! How was yours? I’ve never been a huge Halloween person leading up to the day, but on the actual day of Halloween, I love it! Those kids are just soooo stinkin’ cute in their costumes and some of them are seriously so creative! At our school a few of the standouts included Pac-Man and his ghosts, KFC Colonel, basket of laundry with washer/dryer, Slurpee, film strip, and the cutest little pilot inside his airplane! Of course I have to give a shout out to my own kids- the sweetest ballerina you ever did see and a pretty cute Michael Jackson! Hello friends! I hope your weekend was nice and relaxing and you’re beginning today with a fresh start! That’s how I like to start Mondays! We can easily drag into the week kicking and screaming or decide to make it great, even if we don’t feel like it- so that’s what I’m going with today! Let’s make it great! We made some progress on getting James’ Halloween costume together and decided that Jordan will be a little ballerina. She’s going to be so adorable with her hair in two little buns and in that tiny leotard and ballerina slippers! Hi friends! Welcome back to Day 2 of our trip to New Orleans! (If you missed it, check out Day 1 here, including a recap of the hip, new hotel we stayed at). Just getting away was amazing, but waking up in a new city with a whole day to play and explore is so exciting! The next morning we got up early to make a 7:45 AM reservation at Willa Jean for breakfast. No one was super thrilled about waking up so early when we’d had been out late the night before, but that was the only time they had and we really wanted to go there. *Thank you to Nordstrom for sponsoring today’s post! 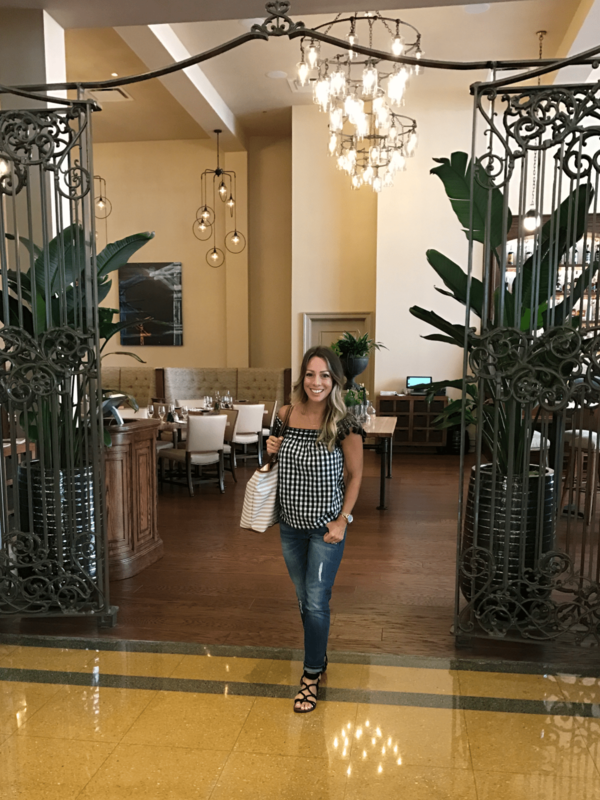 I’m so excited to share our New Orleans trip with you today! We ate, we drank, saw the sights, shopped and hung out at the pool and did I mention, ate?! It was a lot to pack into two days, but we made every second count! This recap post was becoming longer than a novel, so I’m breaking it into two posts- Day 1 today and Day 2 tomorrow. You’ll definitely want to come back so I can share ALL the good food we ate with you! Our trip was couples only and we went with four of our good friends. We’ve traveled with them before and it’s always fun when you have a great group to spend so much time with. Unfortunately, my husband got called away on work at the last minute so he didn’t get to meet up with us until dinner the first night there. I wanted to be comfy and cute for the trip over, so I wore my relaxed boyfriend jeans and the fun gingham top with tassel sleeves you saw in my latest dressing room post. I got so many compliments on it, seems everyone is a fan of classic black and white gingham, but the petite tassels put it over the top in the cute department. It’s a quick flight from Houston to New Orleans, so we arrived in a jiffy. Hi friends! Wasn’t that a weird 4th of July being on a Tuesday this year?! It made me feel all out of whack, constantly forgetting what day of the week it was since Friday, but I guess that’s a good thing, right?! We took an impromptu family trip to Lost Pines in Bastrop, Texas and it was so much fun! We’ve been before with just James, but this trip was even better with two kiddos and so much to do that we got to take advantage of this time. We went Saturday morning and came back Monday morning, but I wish we had stayed one more day. The typical two-hour car trip took 4 hours with traffic (we left at 11 am), a stop at Subway and, of course, the obligatory pitstop at Buccee’s. If you road trip in Texas, you have to stop at Buccee’s. James got a pair of realistic handcuffs and played with them all weekend and I got a bag of caramel popcorn and ate 3/4 of it on the trip, then felt sick! Ahh, vacation life! But, I really recommend a two-night stay if you visit Lost Pines because, once you get there, it takes some time to actually relax, so one more day would’ve been even better! For us, once we were really getting into the vacation groove, it was time to come home! Because the trip was planned last minute, we packed the morning of and just threw everything in the car. I kept my road trip outfit comfy and casual, and because I get cold in the car, wore a longer sleeve top. It’s so comfy I actually wore it home too. How’s your week going friends?! If I didn’t already know it, last weekend taught me that I am definitely NOT 21 anymore! Three jam-packed days of classes and meetings and more importantly, parties and dancing and 2 am chat sessions with my girlfriends and a side of Taco Bueno really wore me out! Then, I got home and my brain was overflowing and I couldn’t sleep! It was definitely worth going though because when you have so many friends scattered all over the US and a chance to get together in one place, you have to take advantage of it! Hi guys! How was your weekend? Never enough weekend time before Monday rolls again around, right?! Well, might as well embrace it and the fact that we’re officially in April! Hopefully, the April showers we’ve been getting will lead to lots of May flowers! We are back from our Spring Break and back to real life with school, sports and schedules. But that’s okay, a little break away always rejuvenates and energizes and now I’m feeling particularly ready for all the Spring goodness! For our Spring Break, we went to Galveston (a nearby beach town) and Waco (hello Fixer Upper!) 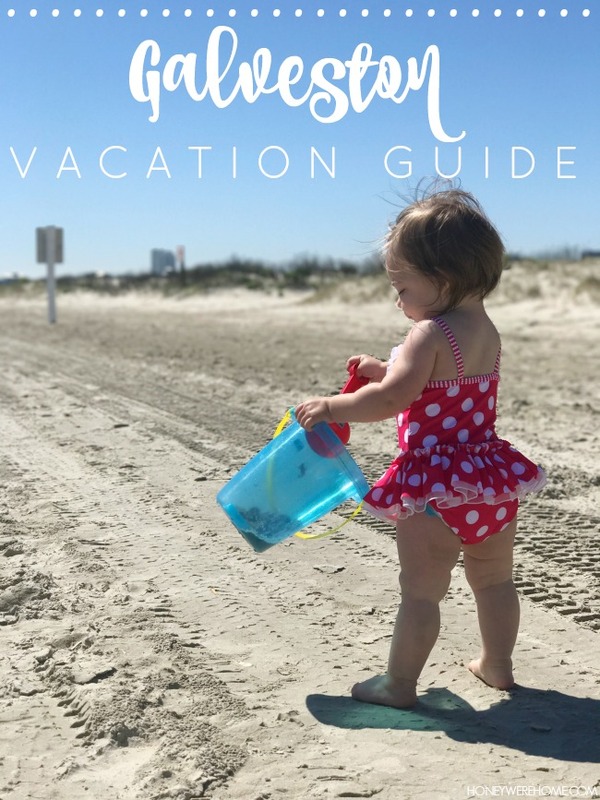 and today I’m sharing scenes from our Galveston trip, along with where we stayed, good things to eat, and lots of fun things to do if you decide to vacation there. 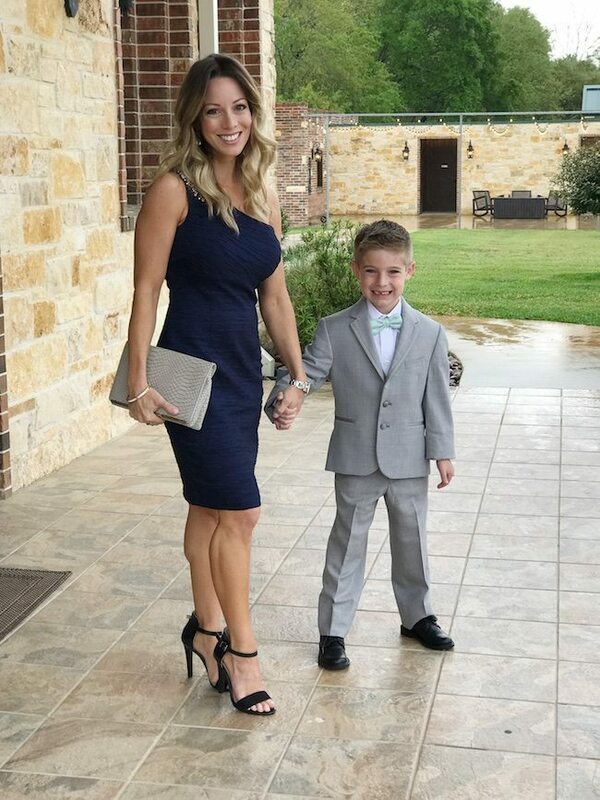 James wore the grey rental tux to match the groomsmen and cutie pie Jordan was lucky to be gifted this gorgeous gold dress from our friends. How was your weekend friends? Ours have been packed lately with sports but we did have a nice relaxing Sunday and I got lots done around the house. On Saturday, in between soccer and baseball games, my girlfriend and I took a quick trip down to Galveston for my trainer’s bodybuilding show. As luck would have it, we arrived while the show was at a break, but we took advantage of being at the beach and had lunch on the patio at The Spot, dug our feet into the sand, and browsed some local shops before heading home. I couldn’t stop smiling the whole time we were there. I’ve been wanting to write this post for a long time, and after such a positive response from the NYC Food Tour post, it prompted me to finally get it done! 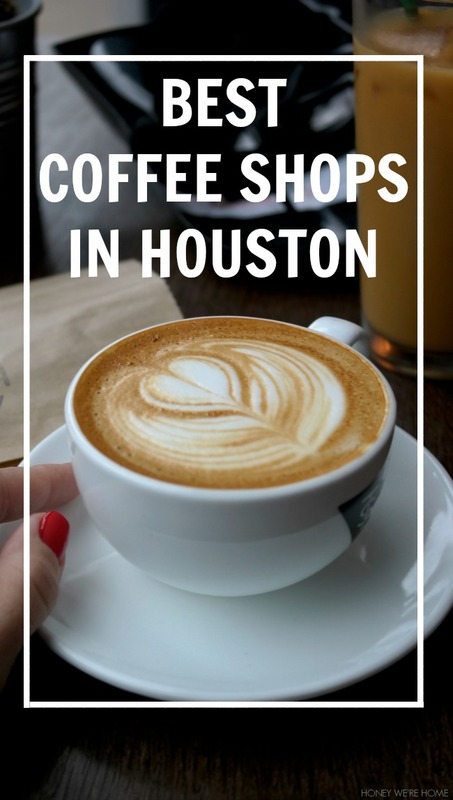 My hubby and I aren’t big drinkers, but we love a good cup of coffee and Houston hosts a number of great coffee shops to sit back, relax and enjoy the brew. We’ll go as a family or as a quickie day date when it’s been too inconvenient or hard to line up a sitter for an evening out. Good Monday morning friends! I got back from a jam-packed trip to NYC on Saturday and I’m so glad I went. Did you guys see on Snapchat or InstaStories? Y’all know how hard it was to leave Jordan, and I swear she grew three months in three days! While I was gone she went from pulling up and standing to pulling up and standing and letting go! Girl, slow down! This mama can’t keep up! Okay, you guys seriously rock! Ask and you shall receive! I asked for help narrowing down my dress choices and y’all let me know what you thought! Thank you! Sometimes you just want that extra input from your girlfriends to help you decide. I respect your opinions (y’all are a smart bunch with good taste!) and appreciate you taking the time to weigh in. After my mini meltdown yesterday (as seen on Snap) when Grandma took Jordan to her house, I had to pull myself together and get focused on getting ready to get out the door. As a stay-at-home mom, I have to admit, as much as I usually look forward to summer, I was apprehensive about this one. I’m sure it was because it would be my first summer home with two kiddos; a 6 year-old and a 4 month-old. It’s hard enough to juggle a baby alone, but add in the older sibling and I worried that I’d be overwhelmed and unable to get out the door to do fun activities with my son having a baby in tow. My son loves video games and his iPad and watching YouTube videos, and he’d probably do that all day if I’d let him. For the last four years, every September, Better Homes & Gardens presents its Sylemaker issue and focuses on individuals who “influence style at home and beyond.” I’m a digital subscriber to the magazine, and this past issue was filled with stylemakers such as Darby Stanchfield, Erin Gleenson, Eddie Ross and Jen Ramos. A day-long “Stylemaker Celebration” event is held in NYC as a way for influencers and the magazine to come together and share ideas and talents with each other. It’s awesome these days to see brands and magazines taking bloggers more seriously and honoring what they bring to the table creatively and through their blogs.